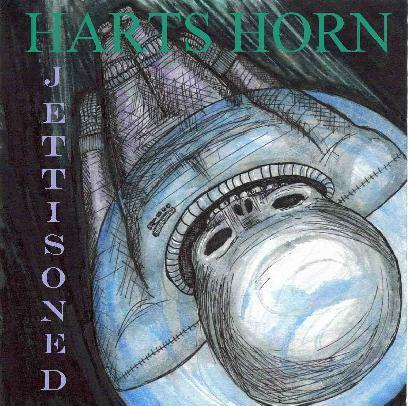 From Indiana, Harts Horn is primarily a solo project that encompasses the otherworldly visions of guitarist/keyboardist Joe Davis. Davis' medium is the construction of dense sonic architecture that has its antecedents in the experimental work of such Gothtech luminaries as Richard Pinhas, Peter Frohmader and Conrad Schnitzler. Sometimes dark and forbidding, while at other times dreamy and trance-inducing, the four extended pieces on Jettisoned remind one of the sensations experienced while falling through the yawning blackness of the space between the stars. Thus, the aptly titled "Drifting in Stasis," while tethered to earthbase by a synthesized hypnotic bleep, makes a long spiraling reconnaissance voyage through intersolar space with the help of an array of dissonant and angular synth patterns that slowly morph from one texture to another. Some decidedly Frippian-inspired lead guitar forays create a sometimes aggressive feel to music that is otherwise the perfect accompaniment to an extended vacation in an isolation tank. The addition of bass and drums on "Waking/Realizing" to support Davis' fuzzed-out psychedelic guitar explorations introduces a much harder-edged approach to Harts Horn's post-Heldon/Lard Free sonic attack on the human sensorium. "Ambient Void," which features the verse and voice of Paul Angelosanto, is a mind-altering trip through the surreal landscape of an astronaut's hallucinogenic nightmare. Like one of Robert Calvert's astral poems from Hawkwind's Space Ritual, "Ambient Void" engulfs the alienated narrator's dream voice in an electronic storm of humming circuitry and sizzling solar wind. "The Skull in the Helmet" brings Jettisoned to an appropriately somber close, with ringing bell chimes cascading like meteors across great starscapes of anarchic guitar soloing, muted bass and eerily modulated synth oscillations. The overall effect is much like the rest of Jettisoned-a grim sonic portrait of the void conceived as the final troubled resting place for the heroes of the space age trapped forever in the decaying orbit of an alien sun.